Belgian Malinois vs German Shepherd – Can You Go Wrong With Your Pick? The German shepherd is highly regarded as the best police dog. But he is also a popular family pet. In the past few years, however, the Belgian Malinois is rising up in the ranks of popularity. And given how these two breeds are very similar, people often have a tough choice to make between Belgian Malinois and German shepherd. Which one is better? Or better said, which one is more suitable for you? Let’s take a look at all of the differences between these two breeds. Let’s start with the most obvious difference, size. This is the first difference you will notice. The German Shepherd is considered to be a large dog, weighing between 50 and 70 pounds. An adult of this breed can go as high as 90 pounds, and the dog stands between 22 and 26 inches tall. The male is two inches taller than females. Belgian Malinois, on the other side, is also a large sized dog, but weighs little less. An adult male goes up to 80 pounds and stands almost the same as a German shepherd, between 22 to 26 inches. The difference is in the weight, as the German shepherd can go up to 10 pounds more. This breed has strong jaws and a black nose, with more triangular eyes and tan colored fur. The black saddle is a signature feature of the German Shepherd. These dogs have long and straight hair that lies close to the body. In some cases, there might be wavy hair, but that is rare. Their coat is available in a variety of colors and patterns, but it is always a combination of black, red, and sable. The German shepherd is a heavy shedder, and he sheds all year long. Be prepared to clean up the mess. This is another huge difference between the two breeds, as Belgian Malinois have short, fawn-colored straight hair. The breed is known for its hard topcoat, and a dense undercoat. Thanks to this feature, the Malinois is protected against harsh weather conditions. In most cases, the color is fawn with black ears. You can notice a tiny bit of white on the tips of the toes. We said previously that the GSD sheds a lot. They are famously known as German Shedders, as they shed through the entire year. They shed a ton of hair at once, two times per year. And the sad part is, there is no magic solution for shedding. You just have to be prepared to clean up the mess. Brushing your dog’s fur for 3 times per week can help, but you have to invest in a handy vacuum cleaner. A positive is that because of all the shedding, German shepherds are generally clean and odorless dogs. You need a ton of chewing toys as well, to keep their teeth healthy and clean. Do not bath them often, only when they are in dire need. Bathing the dog too often can strip the German shepherd off its natural oils. Because of their short and straight hair, the Malinois is a lot easier to care for. All you need is a simple weekly brush with a firm bristle brush, and that is that. They are moderate shedders and shed only during the spring and fall, when they change their coat. While the first two are physical differences, the rest is character-wise. And that is where you make your pick in most cases. The dog might look aloof, but he is certainly not shy. The German shepherd does not make friends easily, but once he does, he remains extremely loyal. Their nature is easy going and approachable with loved ones, but they are also protective of strangers. 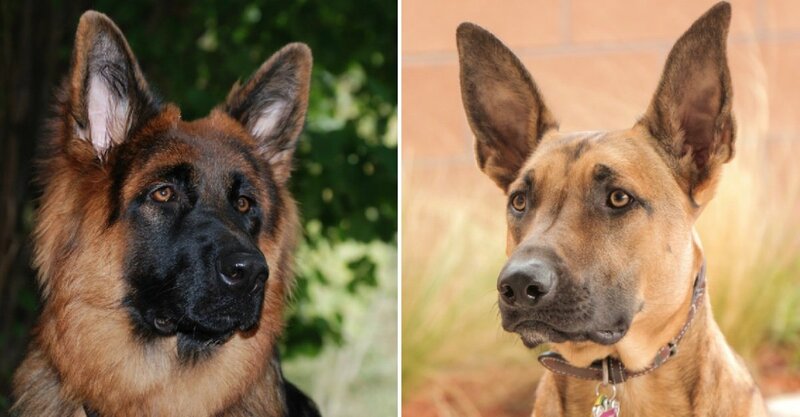 Remember, both these breeds, Belgian Malinois vs German shepherd are watchdogs. GSD can be trained to do almost anything, even risky jobs like rescuing survivors from an avalanche. They are great for guiding disabled persons. The one downside to their temperament is they are prone to separation anxiety. You cannot leave the dog alone for long periods, and a bored dog will vent by chewing on things at home and manifesting other forms of destructive behavior. An outstanding working dog, the Belgian Malinois seems reserved toward strangers. This is the same trait as the German shepherd dog. You can train the dog to protect people and their property. One huge difference between the GSD and Malinois is the latter is more analytical. In other words, you can command the German Shepherd to do anything, even attack a bear, and he will listen. The Malinois will analyze the situation. They also analyze every situation, and sense when you are in danger. If a Malinois lives in a household with other pets or children, they need even more training and socializing. They are considered high energy dogs, and they need a lot of exercise. Their herding background translates to high prey drive, which can be problematic when around other dogs. Moving objects can mean anything in the eyes of a Malinois, so they need to be trained to recognize what is what. While they CAN make a great family pet, they are not suitable for first-time dog owners, as they have their own mind and can be stubborn and headstrong. While the GSD is a great dog, they are prone to several health conditions. Make sure to get your pet from a reliable breeder, as you can be sure there is no genetic predisposal to health concerns. Both of these dog breeds respond great to positive reinforcement based training. This type of training is crucial for powerful and strong-willed dog breeds like the Malinois and GSD. Remember, they are quite dominant, and do not respond well to dominant training. Both Belgian Malinoises and German Shepherd can understand commands well and be easily taught. Training of a GSD can be quite difficult, as in some cases, they can be quite stubborn. In the same time, they are highly intelligent. You have to begin training as soon as you get the dog at home, and reward with lots of treats to maintain progress. This breed enjoys training, but may have a difficult time in the first few sessions. Malinois tend to be more involved in the activity, which means they are easier for the trainer. But there is one caveat, Belgian Malinois usually listen only to one person. That means if you are living in a family house, they will connect to one person, and listen to his commands. They might ignore commands from other people. While the German shepherd is a larger dog breed, he exhibits less aggression compared to the Malinois. The difference is in the nature of the dog. We mentioned that Belgian Malinois have a herding background and a strong prey instinct. That is why they can be quite aggressive towards other dogs. Both of these dog breeds are energetic and great for people who want to practice outdoor activities. And as high energetic dogs, they should not be left idle for long periods. Long walks on and off the leash are mandatory for these two breeds. If you want the more popular breed, go for the German shepherd. After all, GSD ranks second on the American Kennel Club in popularity for several years. The Malinois is rising up in the ranks, but it is still in the 40 to 50 range. AKC rankings play a part in how much you might spend on a dog. A German shepherd from a high profile breeder will cost five to ten times more than a Belgian Malinois.